Recently, LoveToKnow was able to speak with author and renown herbalist Richo Cech about growing medicinal herbs in the home garden in this Horizon Herbs interview. Horizon Herbs, founded by Richo Cech, is a company based in Oregon that specializes in organic medicinal herbs and vegetables. They offer a wide variety of seeds, plants and roots for the home gardener along with other useful related products. LoveToKnow (LTK): Why should people grow their own medicinal herbs? Richo Cech (RC): Growing your own herbs gives you an assurance of fresh and properly identified (and therefore very likely to be effective) material. For instance, direct consumption of fresh Echinacea root is a time-honored and effective way of taking in the immune stimulating activity of the herb. That's the way the Native Americans originally used the plant. If you don't grow your own, its hard to find the fresh root. And, growing your own is cheaper than buying the medicinal herb from the store, takes up less resources in packaging, less "herb miles" in the delivery, and gives the butterflies a source of nectar to drink! LTK: Does it matter if seeds are organic or not, and why? RC: If the seeds are organically grown, it means the grower cares about the earth. If you grow an organic garden, organic seeds (which have already been selected to perform well in an organic system) are much more likely to perform well for you than seeds grown with the use of chemicals. Organic seeds will produce plants naturally pest resistant and high in phytonutrients. LTK: What about hybrids? Will they also have medicinal value? RC: Hybridized medicinal herbs can be pretty in the garden and may be quite vigorous growers, but it is best to use the open pollinated, original forms of the plants for medicinal use. We rely heavily on the healing tradition (the experiences of herbalists through the ages) to let us know which herb to use in what form for which ailment, and if we get a hybrid form, then we can no longer trust in that tradition to ensure us that the herbs we are using are going to act in the expected manner. We call these kinds of herbs the "native land races" and here at Horizon Herbs we strive to maintain these original lines instead of buying into the glitz of newly produced hybrids. 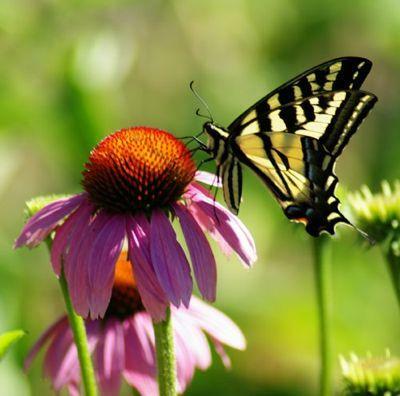 There are nine native species of Echinacea endemic to North America, for instance. We strive to maintain all nine species, grown in seclusion, and find that they give us plenty of variability in terms of flower form, size of plant, medicinality, special characteristics, environmental preferences, etc. With all that variation already available to us, who needs hybrids? LTK: What herbs should everyone have in their garden? RC: That is a big question and I can't go into it too deeply here, but since Arnica is needed in the main herbal anti inflammatory compounds for external use (such as the ancient formula combining Arnica, Saint John's Wort and Calendula), and since Arnica is almost everywhere (especially in Europe) a protected plant in wild situations, then I would suggest growing it in the garden. 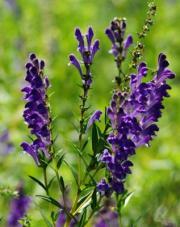 This gives guilt-free availability of an essential herb that otherwise might be taken from dwindling wild stands. I would also definitely grow Calendula, just because its really easy to grow and has many applications as an antiseptic salve and in homemade herbal cosmetics. Another fantastically useful herb is Comfrey, which has incredibly diverse applications, from veterinary medicine to poultry feed to compost making to tea making to salve making--the uses are legion; the plant is forever giving. The naturopaths tell us that the best thing we can do for the integrity of our bloodstreams is to eat a clove of fresh garlic daily (probably easiest to use in your salad dressing). This will make the blood thinner, so it travels more efficiently through the body, and reduces risk of arteriosclerosis from excessive fat buildup in the vascular system. I'd end this with Self Heal because it gives selflessly to the grower. So many of us suffer from oral herpes (canker sores) from time to time and this little flower, dried and made into a simple tea, is simply the best treatment you can find for healing the sores. Once you get used to using Self Heal, a whole herbal world of opportunity begins to open to you, and many other plants can be grown and tried--chickweed, basil, gotu kola--the list is extensive. I would refer readers to my book Making Plant Medicine if there is a serious interest in entering the portal of this world of self treatment with herbs from the garden. LTK: Where do you get your seeds? RC: We grow our seeds at Horizon Herbs Seed Farm. The great thing about open pollinated seeds is that you can save them, true to form, year in and year out. We also look for new species to try, of course, and so we travel worldwide to access interesting species (e.g. from China, Europe or East Africa) and then bring them home and test how well they do in standard organic conditions. Some fly, and some flop. The ones that fly become a part of our fairly extensive lexicon--we grow over a thousand species at this point in time. LTK: How long can seeds be saved and still be viable? RC: For the most part medicinal herb seeds are good for 3 years, if you keep them dry, cool and out of the light. You can store them sealed in their paper packaging in a zip-loc baggie in the fridge (not the freezer). But some seeds such as Valerian or Chamomile are short-lived and should be planted within a year of receipt. Others, such as Elderberry and Goldenseal, really need to be kept fresh and undried for best performance. These we send in a small cellophane bag, buried in moist medium, in order to ensure good performance. LTK: How should seeds be started and planted? RC: Medicinal herb seeds are quite diverse in terms of their reproduction biology. About 50 percent of temperate species do fine with standard greenhouse cultivation--preparing a pot or a flat of good potting soil, burying the seeds just under the surface, keeping evenly watered, warm, and in the light until germination. Don't put them between paper towels, in the basement on the water heater, or on the windowsill in minimal light. Give them the elements--sun, rain, soil and oscillating temperatures of night and day--this awakens them! The other 50 percent of temperate species do best sown in the fall and left in the soil to soften and swell through the winter, after which they germinate in the spring. Seeds that have been domesticated tend to fall into the first category, while very wild seeds tend to fall into the second. That's why we've been issuing two catalogs--a spring/summer catalog and a fall/winter catalog for many years now--to try to help people understand the seasonal requirements of sowing medicinal herb seeds. For more information, I recommend getting a copy of our current catalog. Go to HorizonHerbs.com, or for those who really want to delve into the how, why and what to do of medicinal herb growing, get a copy of The Medicinal Herb Grower. You will be, if nothing else, entertained. I guarantee it.